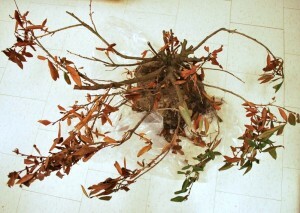 Last week, we saw photographs of cherrylaurel that got pummeled by the winter. Of course, I proved my plant ignorance in the blog post by calling the photos of cherrylaurel, Prunus laurocerasus, mountain laurel, which is Kalmia latifolia. 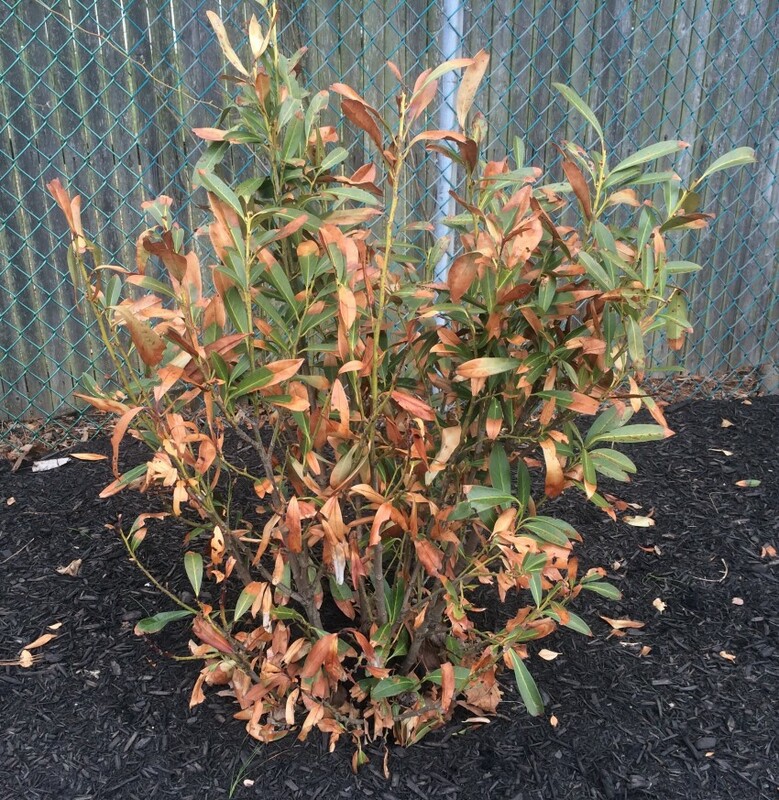 No doubt mountain laurel got hurt in the winter just the same as cherrylaurel did and no doubt I need a better editor! So, now that we got the original post fixed and the mea culpa out of the way, we can get down to business. 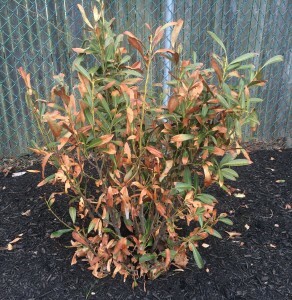 We’ve seen plenty of cherrylaurel with winter damage in the field, so when a residential client emailed me about her declining plants, I assumed that winter injury was going to be the problem. Good thing I asked for a whole plant and good thing Sabrina (yup, she did this one) was thorough in her evaluation (do you expect anything less? ), because we got a nice surprise down at the base of the shrub. Cutting away at the bark revealed the larva of the peachtree borer, Synanthedon exitiosa. This clearwinged moth (Fam:Sesiidae) causes serious damage to peach, cherry, plum, nectarine, and apricot. 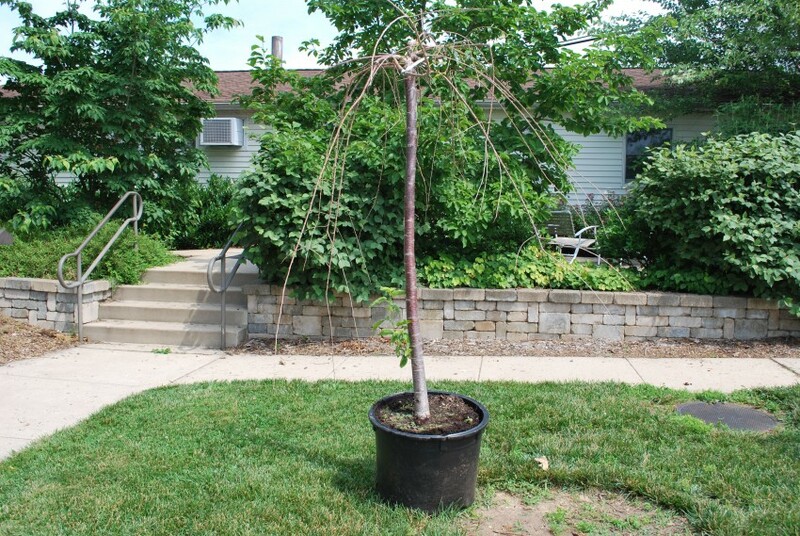 In ornamental landscapes and nurseries this species is a key pest of many other plants in the genus Prunus including weeping cherry, sand cherry, cherrylaurel, and purple leaf plum. 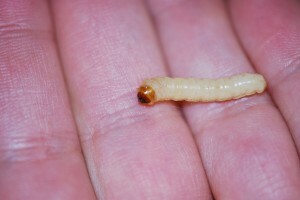 Only the larval stage of the peachtree borer causes injury. 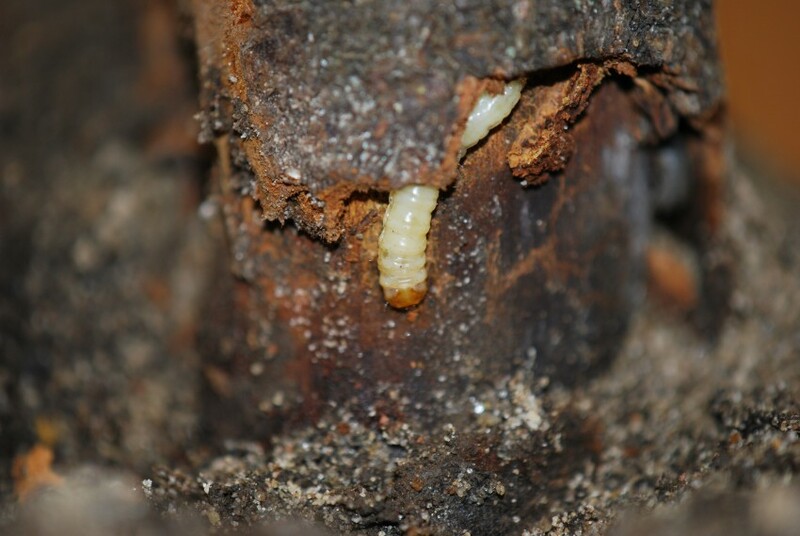 Larvae burrow in and feed on the cambium and inner bark, usually at the base of the trunk just below or slightly above the soil surface. On larger trees, they also feed on roots that are near the crown at the soil surface. 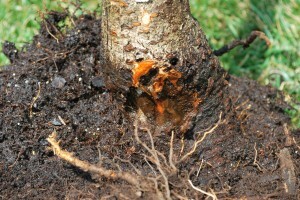 Larvae overwinter under the bark and in the late spring they move into the soil to pupate. 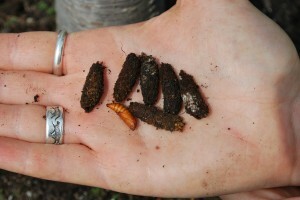 Elongate cocoons are constructed from silk, soil, and plant debris. In 3-4 weeks, chestnut colored pupae force their way out of their cocoons and up through the soil surface. 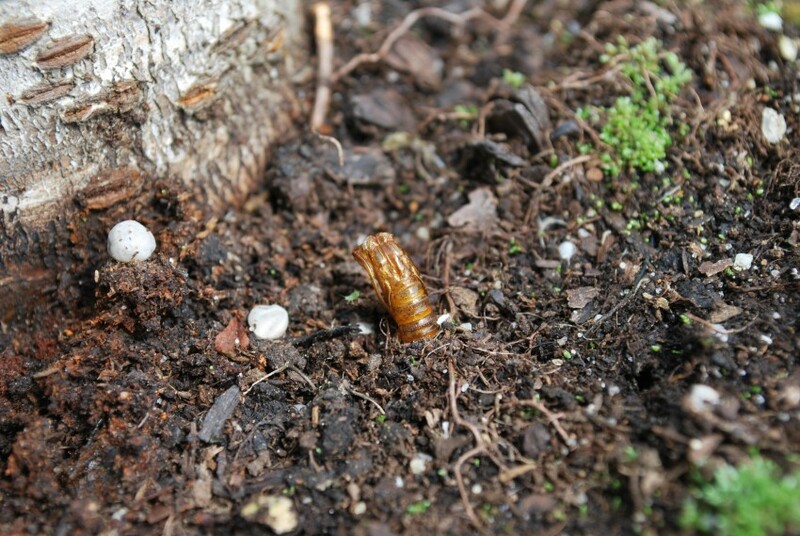 As the adult moths emerge, the pupal exuviae (exoskeleton) remains behind and protrudes partially above the soil surface. The presence of the exuviae is an excellent diagnostic tool. 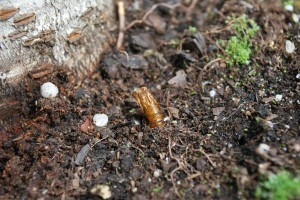 Mated females will lay up to 800 eggs in wounds or cracks at or near the soil surface. Interestingly enough, these insects will return to the same wound year after year until the tree is eventually girdled and killed. A female clearwinged moth might also like crown tissue damaged by freezing in the winter, so after a severe winter it would be prudent to keep your eyes on susceptible plants for future infestations. The great plant diagnostician and philosopher, Jerry Garcia, once sang: “Goes to show, you don’t ever know. Watch each card you play and play it slow. Don’t you let that deal go down”… and don’t you jump to conclusions, even after a long, tough winter.